100% of every donation goes directly to The Children's Stollery Hospital. We deeply appreciate your support. LISA POUDRIER Setting up for deadlifts. Click on the image for my video. is to share the vast benefits of altruism and fitness with as many people as possible in order to surround myself with people that are beautiful on the inside and out. One thing you should know when choosing a personal trainer is that the clear majority of personal trainers, (79%) will not last a year in the industry; which is to say, the industry is saturated with beginners. I have been practicing fitness and nutrition almost my whole life and professionally for 9 years. With me you will get an expert for the same price, if not better, than most of these beginner personal trainers. I teach my clients everything I know because it is my passion to create a healthy lifestyle for as many people as I can. You will become an expert and know more than most personal trainers by the time I'm done with you. Sometimes diet and exercise is all that is needed to achieve a person's goal. Sometimes people have obstacles with their fitness journey and may need help with special skills in hormone imbalances, detoxification, the microbiome (bacteria of the body), and of course stress and sleep problems. I can even help you with DNA testing to see what things you should be doing and what things you should avoid specifically for you. 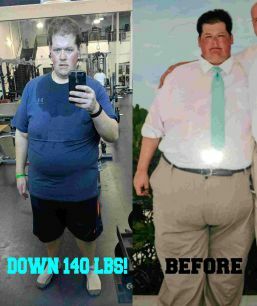 I am the weight loss specialist. 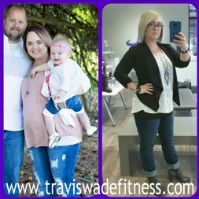 If you’re serious about weight loss and you have tried and failed, then it’s time to meet me. 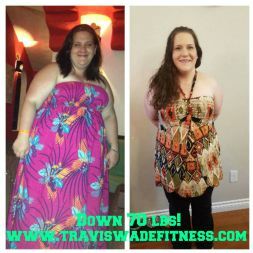 My clients are getting amazing results and I want that for everyone. I garantee results in the first 10 days! If you'll do what I suggest, you will see an average weight loss of 8.88 pounds in the first 10 days! Plateauing with weight loss is very common and so is going up and down with weight. It’s upsetting to see someone putting in the effort and not getting the results they deserve. Common problems to be overcome are hormone imbalances, dysbiosis (imbalance of gut bacteria), toxicity, stress, and learning how to increase your metabolism. CLICK HERE IF YOU WOULD LIKE ME TO PERSONALLY SHOW YOU HOW YOU CAN ACHIEVE YOUR FITNESS GOALS ...FOR FREE! support while making it more fun. 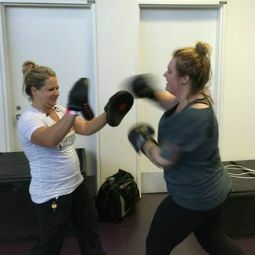 Having fun and providing a stress relief is what we like to do at Travis Wade Fitness. The number one contribution to health and fitness has become reducing stress. Playing together helps a lot of people blow off steam and enjoy themselves. It can be a great addition to your workouts as well. My philosophy is that you have to enjoy what you're doing when you workout. If you're not liking what you're doing, you'll do it for a while because you have that initial motivation, but after a while, if you aren't enjoying yourself, you will stop. There are many ways to achieve your goals. We will find things you like to do and avoid things you don't like. Nobody wants to go to work all day and get stressed out, just to hit the gym and get more stressed out. I’m a certified personal trainer of 9 years and a registered EMT of 13 years, a fitness fanatic and health nut all of my 45 years. My mission is to share altruism and the vast benefits of fitness with as many people as possible in order to surround myself with people that are beautiful on the inside and out. As an EMT/personal trainer I had the opportunity to acquire free chiropractic care, massage therapy, naturopath, and other health services along with $3,000 a year for health and wellness which I spent on the best personal trainers I could find. I took my opportunity to hire many of the above mentioned professionals in order to educate myself as much as possible in the health industry. I believe in upgrading my education on a non-stop basis. Above my own relentless studying I continually take courses and go to summits and conferences to keep up my education and skills. This is actually one of my favorite activities to do. I geek out on doctor's summits in my spare time. Usually how things work is the doctors do the research then pass the information around between doctors. Then doctors pass the information on to chiropractors and physiotherapists and other professionals. Then personal trainers learn the information and then it becomes mainstream. This trickle down takes about 18 years for info to become mainstream. I skip all that and listen to doctors that are doing the research. If you ever want my resources feel free to contact me. I believe in a coach like approach and I educate my clients with no secrets and let them decide what methods suit them best to achieve their goals. There are many ways for my clients to get what they want. If a person doesn't like doing certain activities, we don't do those ones. On the other hand, if there are certain activities a person likes doing, we will work them in. A client's experience has to be fun, educational, and rewarding. Most people that are in the people helping industry have been through alot and have learned to overcome. They want to pass on their knowledge of how to overcome to others. I am no different. Here's my story. I went through all kinds of hard times as a kid and home was not a good place to be. I needed a way out. I went from being an altar boy one Sunday to Yellowhead Youth Centre boys detention the next Sunday. I mingled with all kinds of inglorious hoodlums and have no judgement of anybody. I remember teachers saying that I was going on a “downward spiral”, but I believed I was going in the right direction. As I got older I worked out more and was always into sports. I got an award in high school for athletics because a teacher noticed that even though I hung out with the wrong crowd, I participated in school sports and worked out a lot. I struggled for a long time with alcohol and never wanted to leave the party scene. I never stopped working out and after trading the party scene for a more athletic lifestyle, I gained a lot of confidence and it spilled over into every aspect of my life. Things started to snowball. I became an EMT to give back to the community. I learned a philosophy of love as opposed to ego or immediate gratification. Eventually, I became a personal trainer and I have never stopped on this path. I see people I haven’t seen in many years and they usually compliment me on how well I look. I always think to myself, "you can’t trade your health for money". I am sure it's obvious to see why I have such a huge passion for helping people without judgement. We all struggle but in the end, with help, we are all stronger together. Did you know you are soooooo good looking?